Cats are present throughout South Australia, as domestic pets, free living strays, and as feral animals. As pets, cats are wonderful companion animals. However, they are also very efficient predators of our native wildlife. Australia’s unique wildlife evolved in an environment that did not include cats. 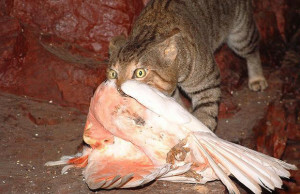 The relatively recent introduction of cats to Australia has added a predator with new hunting techniques that has changed the natural balance. On average a domestic cat kills 16 mammals, 8 birds, 8 reptiles a year according to an Australia-wide survey. In Australia, cats are listed as a potential threat to the survival of at least 58 native species that are considered at risk of extinction. Cats are the host of a blood disease called Toxoplasmosis which can cause sickness and death in some species of wildlife including snakes. Foxes were first introduced into Australia in the 1870’s for recreational hunting purposes. They have since bred to become one of our major vertebrate pests and are a major problem for land holders in agricultural and pastoral areas. However, foxes are highly adaptable animals, and they have also established themselves in the urban fringe areas of nearly all of Australia’s major cities. Being opportunistic feeders, foxes in country areas will feed mainly on small mammals, birds, reptiles, insects and fruit. However in our urban environment they have become scavengers, taking food left outdoors for pets and scraps from domestic rubbish, as well as preying on small pets such as birds, rabbits and guinea pigs. A wide range of small native mammals, birds and reptiles are highly susceptible to fox attack, in some cases fox predication resulting in the extinction of several species. Cages for pets and domestic animals need to be fully enclosed and constructed from material that foxes cannot chew through or dig under. Please call or email if we can be of any assistance in this matter.